Last summer I took my first trip to Nantucket and ate my way through all of the amazing restaurants. You can read about that here. I have so many friends who had spent summers on the island as kids, but I had never been to experience it myself. I went ahead and a booked a long weekend on my own, and I completely fell in love with it from the minute I arrived. I vowed I would make it an annual tradition, and I just returned from another trip to this magical little place. I am already itching to book my trip for next year, but the hotels don't start accepting reservations until January. I'll be locking in my spot for next August as soon as I can. While the island is small, there is so much to do. In addition, there are few places as idyllic as Nantucket. 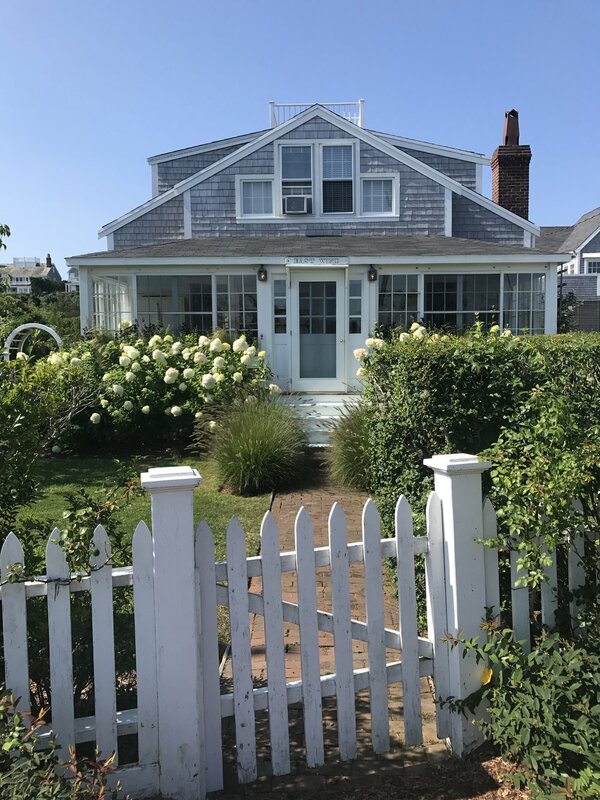 Every street looks like a postcard, and every house is picture perfect with weathered gray shingles, white picket fences, and hydrangeas and window boxes that are perfectly manicured. You honestly don't need to do anything-- as in you could just stroll around the island for days and that would be totally enjoyable. However, I recommend beach hopping to find your favorite spot. The beaches on Nantucket are great, and I loved getting to enjoy Cisco Beach and Jettie's Beach on this most recent trip. Jettie's is a 15 minute walk from town, and Cisco along with a few other beaches like Surfside and Madaket are either a quick drive or shuttle ride. In addition to the beaches, I also love walking to Brant Point Lighthouse which has a beautiful view. Another popular activity on the island is to visit Cisco Brewers. It's actually a brewery, distillery, and winery offering a really fun setting and experience for those visiting Nantucket. In the summer, most days include live bands and music, and multiple food trucks with oysters, dumplings, lobster, and more. It's a very popular activity to visit Cisco in the late afternoon, so you should expect pretty big crowds and a lively experience. Finally, I've heard great things about Bartlett's Farm which I didn't visit on this past trip, but it's definitely on my list. This is where most of the produce on the island is grown, and it's a great place to pick up provisions if you're planning to cook with friends and family. The restaurants on Nantucket are excellent, as well as expensive. However, there is a nice range of options including diners, pizza places, and very upscale restaurants. Given the island's size, it is recommended to make reservations if you can. I visited a lot of the same spots this year (and still highly recommend them), and also got to a few new spots I had been wanting to try. This is a new seafood restaurant and bar that opened on the island in the spring of 2017. I didn't have any meals here, but my friends and I were wowed by the wine list. The options by the glass were plentiful, the bartenders were incredibly knowledgeable, and we ended up trying some very interesting and funky wines over the course of a few days. We liked it so much we came every night before dinner to get the evening started off right. Afterhouse is located at 18 Broad Street. The perfect spot for lunch on the island. While the inside of the restaurant is dark and small, they have a great (and sizable) outdoor patio which is perfect on a summer day. The menu has great burgers, salads, and seafood and they offer a great selection of beer and wines. I got the house salad with field greens, candied pecans, red onion, tomato, cucumber, pea shoots, fried goat cheese and I added fried calamari because... vacation. The restaurant is located next to the hotel I stay at right downtown on Broad Street and works well for families or groups of friends. Brotherhood of Thieves is located at 23 Broad Street. It's definitely a scene, but it's hard to beat the stunning water views at Cru. No matter where you sit, you are surrounded by yachts and beautiful people. In addition, the food happens to be excellent, so it's definitely a must when visiting the island. I've been for both lunch and dinner, and neither one disappoints. I think their warm and buttered lobster roll is out of this world, and they also have a great oyster selection in addition to an impressive raw bar. Just make sure to make a reservation a few weeks before visiting, because a table at Cru is hard to score on the fly. Cru is located at 1 Straight Wharf. The restaurant is open for lunch and dinner, and also happens to be directly across the street from the hotel I stay at. I've had two great meals here, and love the limited yet thoughtful menu. On this trip I had a lobster roll, but I've also loved their calamari and fish tacos on previous visits. The outdoor patio makes for a great lunchtime treat, especially when paired with a glass of rosé. Dune is located at 20 Broad Street. Last year I was only able to try a small bite and a glass of wine at Proprietor's, so I was excited to head back for a full meal this go around. The restaurant was opened a few years back by the team behind American Seasons, which is another staple restaurant on the island. They describe the restaurant as "locally sourced, globally influenced", and the menu includes a hodge podge of small plates including seafood, and many dishes featuring fresh vegetables. Certain dishes here were delicious, but others were misses. The fried broccoli with peanut slaw and sambal vinaigrette was a standout. We also enjoyed the cannelloni of braised short rib and the warm goat cheese with chive biscuits. However, the tomato salad with watermelon should have been a home run in August, yet the tomatoes were too cold and also mealy in texture. The rye cavatelli lacked bite and salt, and the bone marrow with wagyu beef tartare sounded interesting but instead it just ended up being two things that individually tasted good but didn't work together. We had a wonderful bottle of Robert Sinskey Pinot Noir, and we enjoyed the atmosphere at Proprietor's, but it's possible we hit them on a night where everything wasn't firing on all cylinders. I still think it's worth a visit, and I'd also recommend checking out their weekend brunch offering. Proprietor's Bar and Table is located at 9 India Street. This sandwich joint isn't messing around. It's located right at Harbor Square on Straight Wharf, and has absolutely delicious and seasonal ingredients. I loved the Caprese sandwich with basil walnut pesto on herb bread. They are also known for their Turkey Terrific sandwich which has smoked turkey, stuffing, and cranberry sauce on Portugeuse bread. This is your spot for lunch, however it is grab and go, so you can either sit on the benches outside if there is room, or take your sandwiches home to enjoy. Provisions is located at 3 Harbor Square. This is another popular lunch spot serving great sandwiches with Portuguese bread. The setting at Something Natural is hard to beat. It's set back from the street in an open green area with tons of picnic tables and great outdoor seating. They offer classic sandwiches like prime roast beef, honey baked ham, and tuna salad. Whatever you do, don't skip the homemade chocolate chip cookies. They are delicious. Something Natural is located at 50 Cliff Road. I had drinks at Straight Wharf last summer, but this was my first time joining the restaurant for dinner. It has a beautiful ambiance with dimmed lighting and water views. Our meal didn't get off to the best start when the sommelier asked only one of the females at the table for her ID, but we marched on and enjoyed a bottle of Pinot Noir from the Alsace. We ordered three entrees to share, and we all agreed the scallops were the clear winner. They were seared beautifully and served with wild mushrooms, corn, bacon and tomato. The SWR clam bake had great flavors and ingredients such as chorizo and sweet corn, but the lobster was slightly overcooked. The chicken with peaches, hazelnuts, farro, and a green goddess sauce was better than expected. Normally I steer clear from ordering chicken, but this dish was really nicely composed. Straight Wharf is located at 6 Harbor Square. The best ice cream on the island! The line is usually wrapped around the block, but it's worth it for the homemade waffle cones and the delicious flavors such as coffee oreo ice cream or dirty grasshopper. They only take cash, but not to worry as they have an ATM inside should you need it. It's pretty much expected that you hit the Juice Bar every night after dinner, and my friends and I skipped dessert at most restaurants so we could indulge in this tradition. The Juice Bar is located at 12 Broad Street. This is one of my favorite restaurants on the island. It's an upscale Italian concept, but it's very inviting and comfortable. The ingredients are local and fresh, and the homemade pastas are absolutely divine. We had two appetizers that won us over: the special panzanella salad with tomatoes from Bartlett's Farm and ricotta salata as well as the burrata with prosciutto and charred eggplant. I had a stuffed pasta for dinner called scarpinocc which was new to me. It comes from the Lombardy region and stems from the word scarpa in Italian which means shoe. These little gems were filled with marscapone and zucchini and served in brown butter with almonds, basil, and mint. We paired this wonderful meal with a bottle of Nebbiolo and left Ventuno quite happy. Ventuno is located at 21 Federal Street. For both of my visits to Nantucket I have stayed at the boutique hotel 21 Broad by Lark Hotels. I cannot recommend this hotel enough. It is located within an old Victorian home that was beautifully renovated in shades of blue, yellow, and white. The style is beach chic with a twist of modern sophistication. The staff is wonderful, and they make a phenomenal breakfast every morning that is hard to beat. We enjoyed apricot and bacon scones, coffee cake, bananas foster muffins, and homemade granola (just to name a few). In addition, the hotel has an outstanding outdoor patio with comfortable lounge furniture and an electric fireplace to enjoy in both the mornings and the evenings. I will continue to stay loyal to this lovely place and I can't wait to visit again next year. I was intrigued by the new Greydon House which opened next door to 21 Broad earlier this year. Its a stunning renovation, and appears to be another great addition to the lodging options on Nantucket. The exterior of the hotel could not be more beautifully manicured. I was wowed by the flowers and window boxes. In addition, my friend and I enjoyed the bar for a cocktail one night before dinner. I haven't seen the rooms, but the hotel has a gorgeous design sense.